November 2018 - Popular for its beaches and mineral springs, the Bulgarian city of Varna and its surrounding area have long offered an enviable quality of life. The vibrant metropolis is considered the most cosmopolitan outpost on the Black Sea, a curious blend of port city, naval base and seaside resort. Home to Roman baths, Orthodox cathedrals and postwar high-rises, its skyline is now witnessing a dramatic transformation. One of the most impressive additions to the city’s urban fabric is found in the heart of downtown. 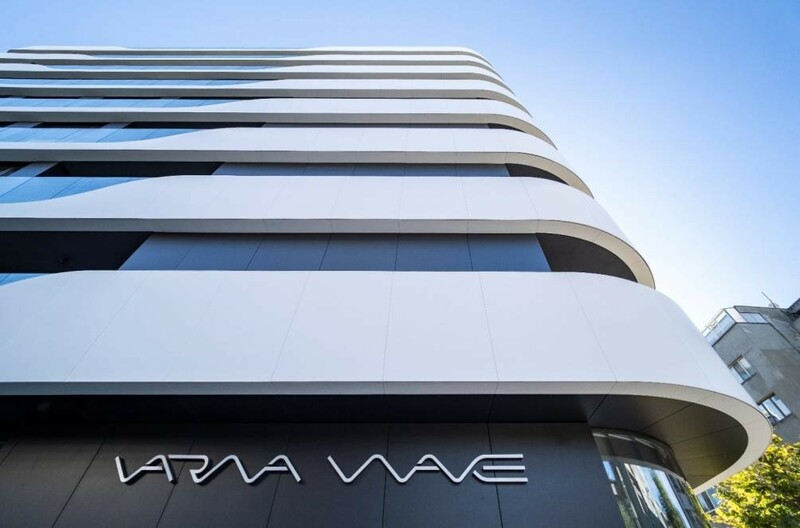 In 2018, local architectural practice STARH unveiled a remarkable new work, the 9-floor, 10 000-sqm Varna Wave residential building. 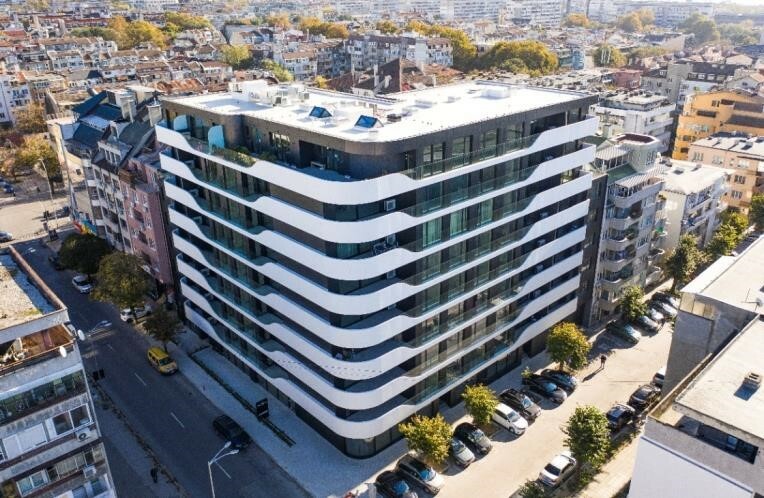 For design cues, architect Svetoslav Stanislavov, the founder of STARH, didn’t have to venture far, opting to look to the nearby undulating waves that lap against the region’s sandy beaches and which attract tourists from near and far. project by STARH; photo by 3inSpirit, all rights reserved. 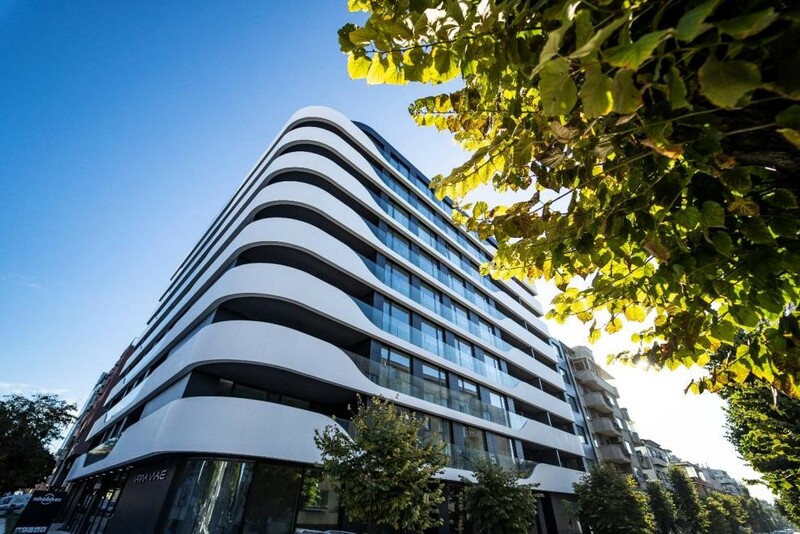 The fluid design envisioned by Stanislavov centered on an eye-catching facade for the L-shaped building. On eight floors of the apartment building there are balconies designed to replicate the effect of waves rolling in and out to sea that wrap around the tower’s northwest and southwest sides. To conjure up free-flowing waves in a static structure, Stanislavov turned to Corian® Exteriors, an innovative solution based on Corian® Solid Surface. The advanced surface’s ability to be thermoformed into fluid, seamless shapes provided the architect and his team with the perfect solution. 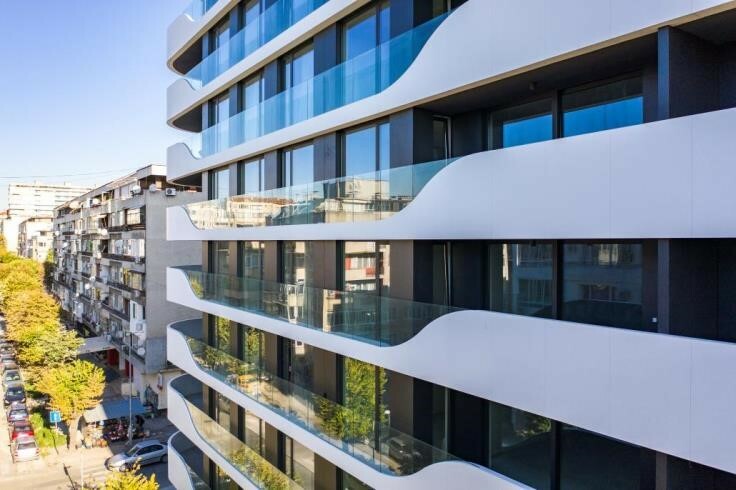 The brief called for approximately 1,500 sqm of Corian® Exteriors, which was paired on the railings with glass, which is present in the middle section of each balcony to offer homeowners unobstructed views. 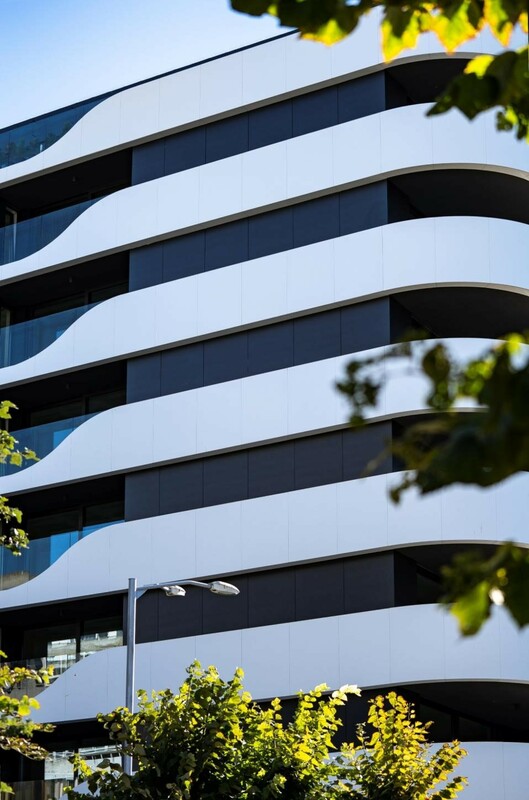 The exterior skin of the building is clad in panels of Swisspearl, a high-density fiber cement that contrasts sharply with the creamy white hue from Corian® Exteriors, helping to further spotlight the Corian® surface and the wave-like effect. Beyond its aesthetic appeal, there were the material’s functional aspects that further convinced Stanislavov to select Corian® Exteriors. 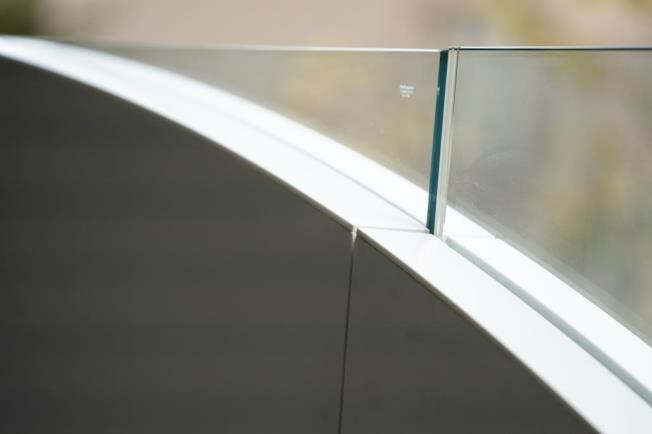 “Used as a ventilated facade, Corian® Exteriors panels increase the energy efficiency of the building offering also high moisture resistance.” Moreover, their UV-resistance offered excellent colorfastness together with the well-known repairability. About STARH (www.starh.bg) – Svetoslav Stanislavov created architectural studio STARH devoted to the cause of helping society and bringing out each architect’s imagination. The architects' mission is to break down stereotypes with their fresh, imaginative approach, expressing themselves through strong and determined forms. The studio looks to overcome challenges with its creative spirit, innovation and bold aesthetic sensibility. Its work covers a wide range of challenges in the built environment – from small architectural structures for private clients to large public projects. By welcoming new approaches, putting feeling into and enjoying each and every step of the creative process, the studio believes it can create new dimensions in the environment that we inhabit.